This month I interviewed Nic Hahn, art teacher extraordinaire and the mastermind behind the exciting blog, Mini Matisse. Nic has been teaching art to individuals of all ages. She currently teaches at a K-6 elementary school in Rogers, Minnesota. 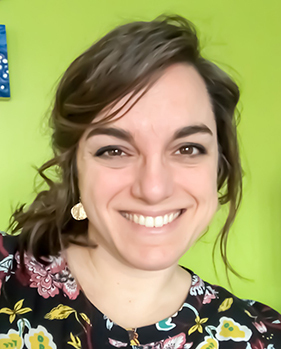 In 2017/2018, Art Educators of Minnesota named her both the Elementary Art Educator of the Year and the Minnesota Art Teacher of the Year. I first met Nic at a workshop that she led (I too am a Minnesota native). From the second she started the session, it was apparent that she was profoundly enthusiastic about this profession and all of its possibilities. Her approach to art education is incredibly ambitious, coming at it from every possible angle. Be sure to check out her writings on the Art of Ed site, as well as her content on Instagram: @minimatisseart and Twitter: @minimatisse. Nic, you maintain a frequently updated blog, write for the Art of Ed site, maintain a very active presence on Instagram and Twitter, incorporate Seesaw and Snapchat into the classroom, initiate exciting programs such as the Artist Trading Cards, devise original lessons at a high frequency, and create your own art. I also know that you have a family and a life outside of teaching. How do you balance it all? I personally have a hard time with this juggling act sometimes. In this profession, I feel like one could work 24 hours a day and still not get everything done. Could you give us some insight regarding work/life balance? This is a question that I am asked often. I feel like I can only tell my truth, and that might not be the answer that will work in someones else's life. My husband and I made a New Year's resolution several years ago to find balance in our lives. We came up with what has become a mantra for the Hahn household: GOAL OR SOUL. This works for us. When we are offered anything in life, we ask ourselves, "Are we doing this for a GOAL, or does it feed our SOUL". We have found that if the task/activity/opportunity/purchase does not fit into "Goal or Soul", we have to let it go. Sharing feeds my soul. Connecting with my "tribe" feeds my soul. I have communicated this to my family and they have respected it and given me time, when I need it, to accomplish my efforts of tweeting, posting, and blogging. When I am online, I am very intentional. I have to give myself a "task", a timeline, and when I’m done, I put my devises down and live life. My number one GOAL/SOUL is my family, next is creativity, third is connecting. I have found that in order to be passionate about my job as an art educator, I have to connect with my tribe--educators who are just as passionate as I am. In saying that, please recognize that I gave you the ideal. I often get off balance and need the support of my family and friends to find my way again. I do my best to be a positive person, but again, need help in this department once and a while. What helps me out is the people in my life reminding me of the phrase, ‘Goal or Soul’. As mentioned earlier, you regularly use Seesaw and Schoology in your classroom as instructional tools. What are your current views on technology and have they evolved over time? Should a proper balance exist? Excellent question. My philosophy on technology evolves on the daily. I am fortunate to have access to technology for my students and for myself as a staff member. When I’m using technology in the classroom there is a little bit of that "Goal or Soul" echoing in my brain: “Is this the best medium? Why am I posting this? What is most important for my young artists to learn in my minimal time with them in the Art Studio?” I feel as if I have a continuous debate in my head balancing the use of technology. For me (today) the app, Seesaw, is a great way to communicate the process of art to families (otherwise known as our stakeholders). Why is this important? These are the people who need to know how important the Art Studio is. They will fight for what is good for their children, and... Art. IS. GOOD!! I use Schoology with my older students to create a self paced learning environment; however, this continues to be evolving. I’m still learning this application of technology in my classroom. It is very evident that community is very important to you. For example, interacting within the school-wide community (communicating with parents via Seesaw, for one) and the professional community (writing for Art of Ed, posting on your blog or Instagram) seem to be integral parts of your practice. Has this emphasis always been there? Why do you think this is important? Could you explain how this ties into your teaching philosophy? I love my tribe. Once upon a time, in one of the many books I read, I learned about tribes. People who think the same as you, who can push your thoughts farther. It was explained that you can have many tribes for the different facets of your life. So you might have an "artist tribe" who might be different than your "teaching tribe". My husband and I are still madly in love after 15 years; he is my partner for so much of what we share in life, but he does not get an invitation to my "art teaching tribe". See, this is you… the people who are taking time to read this blog. The people who want to show others the "magic of art". I didn’t have this group of people for much of my life. When I found others like me (via social media) I started to grow, because I was growing as a person. I started to share, and because I share, others grow. It expands from there. I want to connect to my parents, because I am a parent of my own kids but more so because I love their kids too. I want to connects with my coworkers, because we are a team… we share our students, and we are the village that helps raise them. Community has become more important to me over the years; I give it energy, because it gives energy right back! I am really inspired by your Artist Trading Cards project. One of my favorite books on art is Lewis Hyde’s, The Gift. He looks at creativity through an anthropological lens, making the argument that art’s main purpose is to be shared and viewed by others (and not necessarily bought and sold). Additionally, he writes on the importance for artists to let go of their work, rather than hoard it in one’s studio. Anyways, this book comes to mind when I look at the Artist Trading Cards. I love how students learn to let go and share their work with others. It is also such an amazingly unfiltered and honest way for students to celebrate creativity from other cultures as well. I could go on and on… Could you explain the Artist Trading Cards project (how it started, what is involved)? What have been the most rewarding moments? Trading art was something that was offered to me by one of my coworkers in 2010. Our Cultural Liaison, Yuko Larson, offered to facilitate a trade with a school from her hometown in Japan. My fifth graders at the time created small format, colorful and energetic watercolors, while their fifth grade students created large format woodcuts that were tremendous! It was not an even trade, but I felt it was an enriching experience because their images explained so much about their student's everyday life. Several years later, I continue to perfect a system of trading art through the MiniMatisse Global Artist Trading Card Swap. Teachers sign up in August on MiniMatisse.blogspot.com to have their class participate. They will send me their cards, which are baseball card-sized (2 ½ X 3 ½ inches) works of art in groups of 10. If a teacher sends me 100 cards, then I will send 100 cards back to them, but these cards will be 10 packs of 10 cards from 10 different places. The teacher will then distribute the ATC’s to their students. There is so much learning and discussion that follows. There are celebrations and connections on social media revolving around the #ATCswap. This year we had a little under 100 schools participate and over 14,500 cards were exchanged. When I see pictures of your classroom, it seems like you really value design. We all know that organization and layout is important for students to get the most out of their time in art, but I think you take it several steps further. The room has a strong overarching aesthetic, but doesn’t necessarily look like your typical elementary art room with random messes or an overabundance of loud bulletin boards. Is it fair to say that you put a high premium on classroom design? Has it been a long process in dialing in your room? Oh yes! I might be in the minority, as I often explain myself as a "minimalistic art teacher". I try to be very intentional in what I place on my walls and what resources I have available for students. When my room gets cluttered, I feel overwhelmed, and I’m sure some of my students do, too. It takes me a long time to "decorate" my space because I want everything that is in my room to have meaning and purpose. To me, the most inspiring artists are those that are on a quest of sorts. They are constantly learning, adapting, and open to seeing where their art takes them. This is in opposition to artists who make a consistent product year after year, and do not necessarily challenge or grow. Regarding your teaching practice, it seems like you more closely resemble the former. From general observation, it is evident that you are continually tweaking, improving, and trying out new things, which I find exciting. Do you think it’s important for art teachers to be on this type of “quest”? Yes and no. See, I’m on that kind of a "quest" because I think it is so important to exercise my creative muscles. I need to make things better, improve… I’m rarely happy with "the way I did it last time". I also answer that question with no. The reason being, I have found that students enjoy playdough in first grade in the same way that I enjoyed playdough in 1st grade in the 1980s and my mom did in the 1950s… There are some activities and skills that are important and engaging developmentally and if an art teacher finds a successful way to present that, then it’s a great choice to continue to do so. If you had not been an art teacher, what career would you have chosen? I don’t think I’m done living yet… and perhaps this isn’t my only career to be had. I often dream of using art to work with patients in memory care, or art as a therapy in a correctional facility. Whatever job I dream about from as far back as I can remember involved the visual arts. It takes three years for sure to feel real success, to get to know your students and families, and to see improvement in your craft. Try to only focus on one thing at a time, and allow yourself to build your program and practice over time. Finally, rely on others around you. Invite volunteers to help, master teachers to guide you, and find other new teachers to bond with. Who are two art teachers that you find particularly inspiring right now? Such a tough question because there are millions of teachers that I’m impressed with every day. I’m going with my "Spirit Animal of Art Teachers", Don Masse. We are so opposite when it comes to organization and preparation, but are totally united in inspiration and creativity. Don has a blog called Shine Brite Zamorano and is active on Twitter: @shinebrite71 and Instagram: @shinebritezamorano. I would say another amazing partner in arts is Miriam Paternoster. She and I connected several years ago through our blogs. She has also been a critical partner in the Artist Trading Card swap. Out of the 100 schools who participated, 22 of them were from Italy: 100% thanks to Miriam. She is a creative soul and I’m proud to call her part of my tribe. Miriam connects with others on Facebook, on Instagram: @paterostermiriam, and through her blog, Arte a Scuola. Do you make your own art, and do you think it is important for art teachers to maintain their own practice? Yes-ish. I create. I create often, but I would not say I’m an active artist in one medium. My passions are watercolor, fibers, printmaking and drawing. I have a style that has been true to my hand for many years. I am a true "art teacher", however, because all mediums are of interest to me. This is such a hard question, but I’ll list two lessons I love. I have millions of lessons to still try, so this answer will continuously change throughout my career, I’m sure. For the upper grades I enjoy creating a camouflage hand. This lesson is mostly about color exploration. 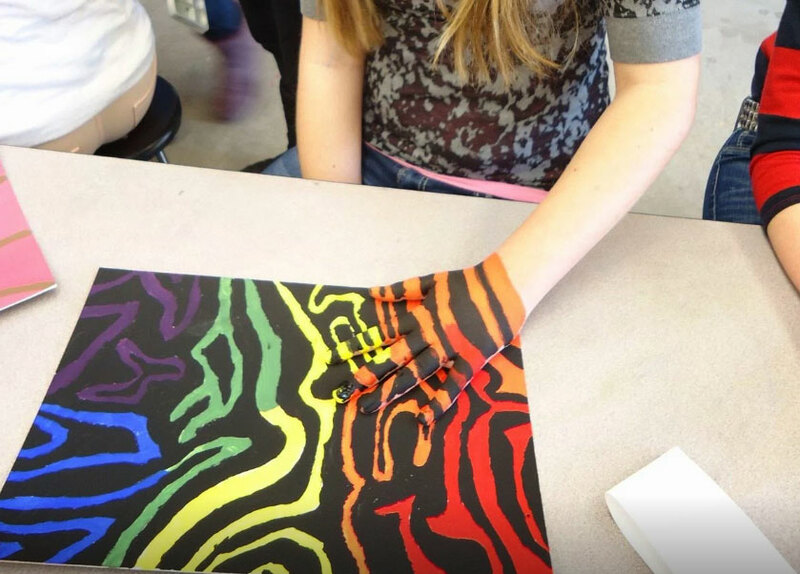 I have encourage them to find a pattern from nature and recreated it on a canvas (cardboard). Throughout the whole process they have to take notes on how they created each color they are mixing for their pallet. This is an easy lesson to differentiate: you can give requirements on how many colors are used, while providing different opportunities for color mixing and exploration. 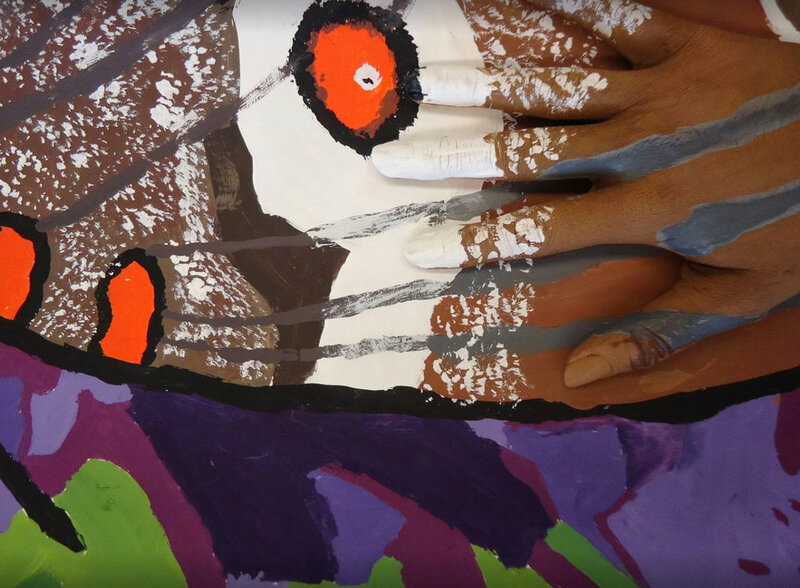 Once the canvas is complete, there is ONE day for the students to recreate their colors and paint their hand. Before they wash their hands off, I take a picture of the painted hand on the canvas. This often leads to another conversation… What is the art? The canvas, your hand, the photograph? This lesson is so RICH in content and conversation and engaging to all students! I’m going to cheat a little with my second pick… rather than a lesson, I’m going to talk about a year long unit for my 3rd graders. I love giving choice in class but I have to find a balance between what my administration recognizes as reaching the standards, and student choice and voice. 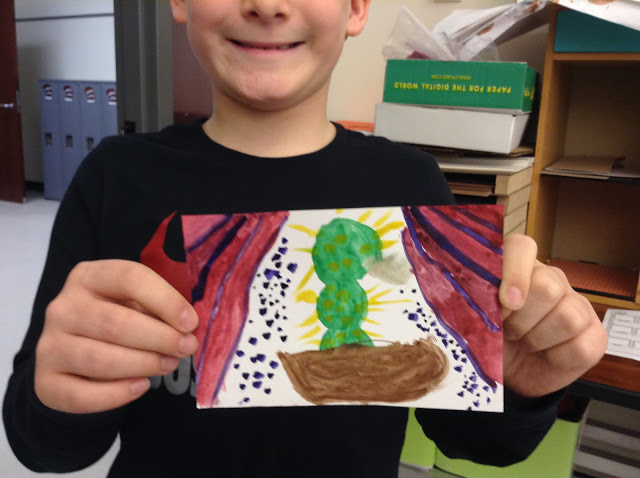 I experimented with 3rd grade last year where I had students exploring ‘Careers in Art’. Each lesson would take two or three visits to the art room where I would introduce the students to a different career in art: architect, fashion designer, interior designer, medical illustrator, and botanist. They would then be given the opportunity to explore this career in several different ways. This would typically be through drawing, painting, sculpture, or play. They could move throughout the room and try all or stay at one station each day.